Candy making. It’s one of those lost arts that is making a huge comeback. “It’s been 15-20 years since I have made them with my Grandma, and I still remember how great it was, but can’t remember what she did” she said. We directed her to the candy oils, the sticks, the corn syrup, food coloring and even some cute bags to put them in. We showed her the recipe, (found on the back of the candy flavors), and gave her that much needed boost in confidence she needed to go home a re-create these memories. After we helped the newbie candy maker, we had several others with the same requests, and very similar stories, (which also makes me wonder, where are these Grandmas hiding all her candy molds? Let’s get people using them!!). 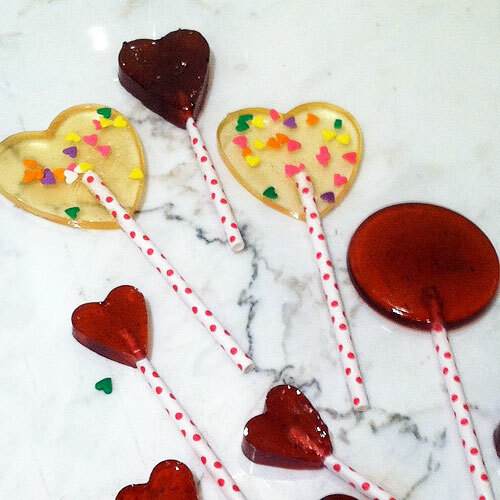 I decided that it was time to get the kids making some valentine’s day treats for their friends. Growing up we did a lot of holiday themed treats. Holiday’s were huge at our house and our Mom made sure to celebrate the whole month. Valentine’s Day was no exception. Red hearts, pink streamers, and candy galore seemed to enter our home and we got so excited for that secret “love” that dropped off mysterious gifts each Valentine’s night to our porch. It was always a yummy gift (from our Dad) that our Mom had either made herself or bought for him to give us. I will always remember that special gift, that my Valentine secretly delivered to me. I gathered the kids, pulled out the supplies-mine were purchased at Gygi’s, my Grandma must be hiding hers still- and we got ready to make some candy! 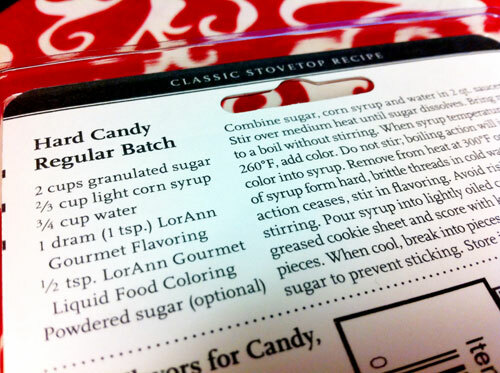 So get ready- we are going to do some candy making. Molds- we used both the old fashioned clip style and also the plastic white molds that will withstand the heat. Both are great and easy to use. Combine sugar, corn syrup, and water in a 2 qt. saucepan. 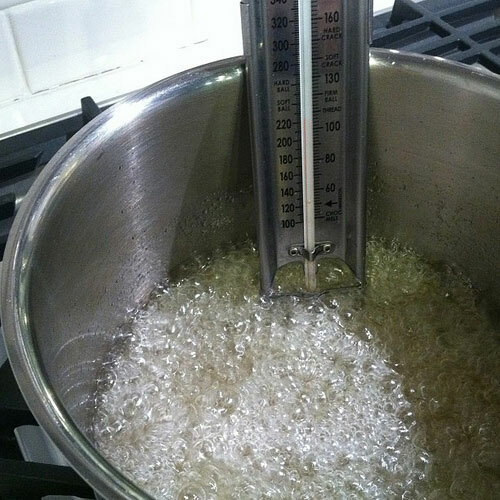 Stir over medium-heat until sugar dissolves. Bring mixture to a boil without stirring. While you are waiting, place your sticks (or paper straws like we have done) in molds. Lightly spray the molds with some non-stick cooking spray. When syrup temp. reaches 260 degrees F, add color. Just a drop at a time. DO NOT STIR. 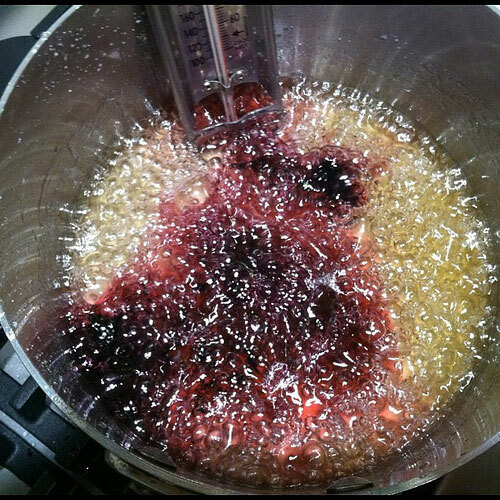 Boiling action will incorporate color into syrup. Leave on stove and carefully watch as the temperature rises to 300 degrees F.
Remove from heat at 300 degrees F. After boiling action ceases, stir in flavoring. 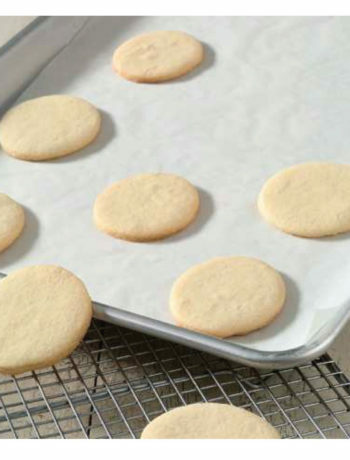 Avoid rising steam when stirring. 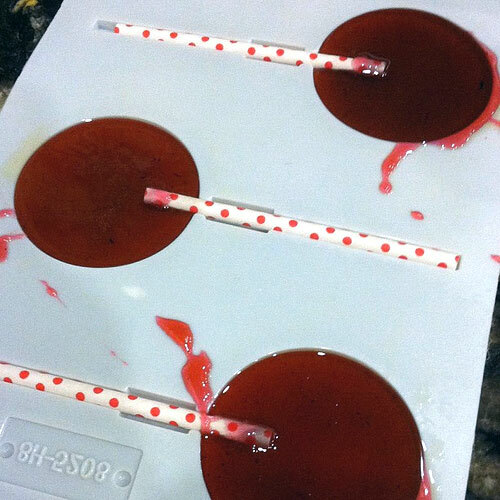 Pour syrup into a lightly oiled candy mold. 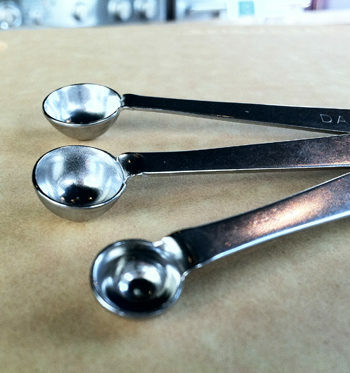 A tablespoon is usually a good amount to pour at a time. It can get hot and messy, so this is a job for Mom or Dad. Here you wait until the candy has hardened. Try to wait 5-10 minutes, depending on how warm your house is. Don’t touch the candy, it will either burn you, stick to you, or leave your lovely fingerprint in the candy. Just wait. 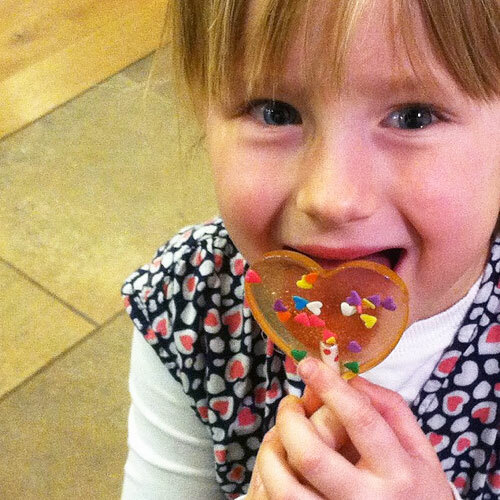 But what fun is a valentine’s treat with out some sprinkles. 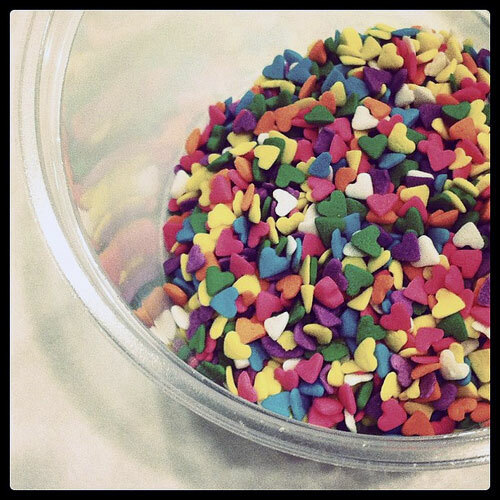 Have you seen how many amazing sprinkles are out there? Man we drool over the sprinkle possibilities out on our shelves! 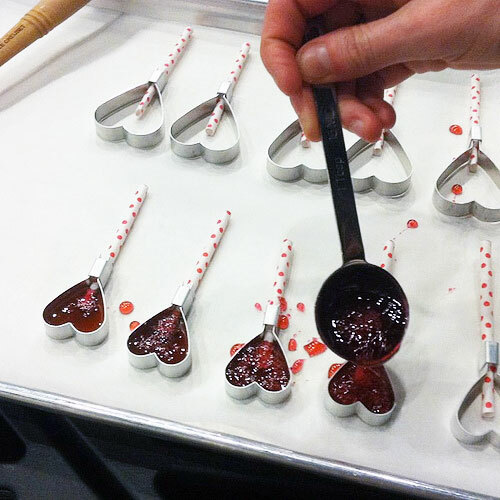 Right after you have poured your candy into the molds (while it is still hot), grab your favorite sprinkles and shake them as light or as generous as you prefer and make them into a special Valentine’s Day Treat! 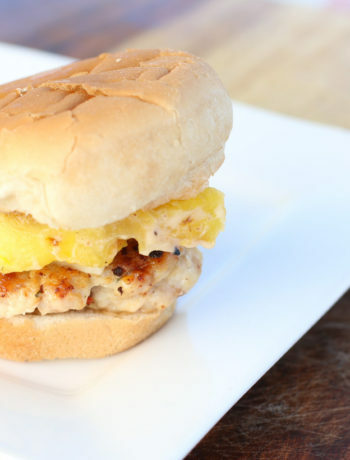 If you want to be extra fun, just add the flavoring and no color. It will slightly tint the candy but make it see-thru. Now you have floating hearts! Easy as that! 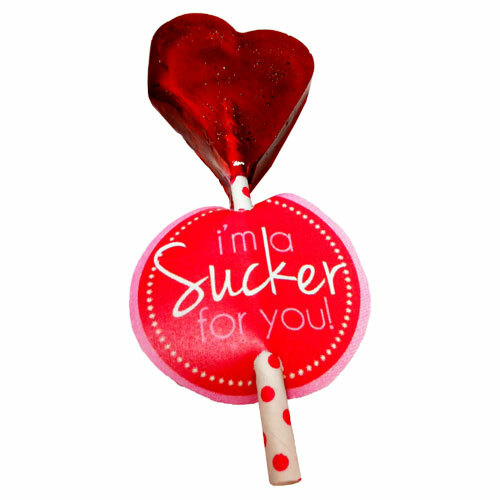 We have made it super easy for you, even created this perfect FREE PRINTABLE for you to dress your sucker’s up. Using a hole punch, in the center top and bottom punch a hole-which was perfect for this paper straw to fit thru! Slide the stick thru the holes, and you are all set! Now go create memories of candy making. No matter what age you are it’s fun! 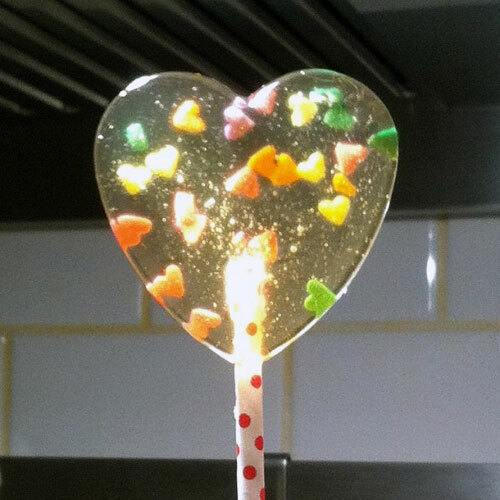 Everyone likes a special handmade treat!